This law can enable you to find the hidden splendor within yourself and others. Unfortunately, we have never been taught how to love unconditionally. Almost all of our loving has been motivated by emotional desires programmed into us at an early age. Most of our love experiences have taught us we must earn or deserve love before we can have it and that others must deserve our love. This is conditional love, it is like a barter or a business transaction. It is no wonder that our well-meaning but unskilled at- tempts to love usually end up in separation and alienation. We have been taught to place conditions on our love: If you really loved me you would… — and then we use one of our addictions to finish the sentence. This is an exchange — it is not unconditional love. 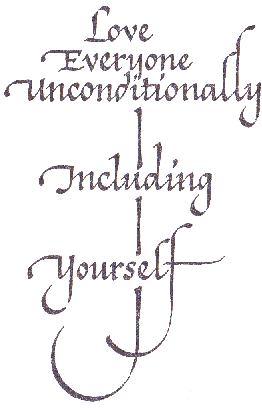 What is unconditional love? It is not, I can love you if you do what my emotional programming — my addictions — says I want you to do. It is just love. Just, I love you because you are there. I love you because you are part of the nowness of my life. I love you because although our bodies and minds may be on different trips, on the consciousness level all of us are alike in our humanness. We are one. Real love is simply accepting another person. Completely and unconditionally! We experience things from his or her psychic space. It is like seeing the world through his or her eyes. Whatever lie or she is going through — whatever he or she is feeling — we have been there, too — at some time in our lives. When we love, we view others as unfolding beings in their journey toward higher consciousness. We realize that no matter how intensely we strive for worldly attainments, we all seek love and oneness on the consciousness level. We are all on the journey to higher consciousness. Some of us are hearing the messages life offers us and are working consciously to eliminate our addictions. Others are not progressing rapidly because they do not yet know how to consciously work on themselves. We must also learn to love ourselves — right here and now. We need to feel that no matter how horrible we have judged our past actions, each day our life begins anew. We have at all times been lovable. A child may be naughty, but he is always lovable. And so we are all children as long as we are programmed with our lower consciousness addictions. So we must accept the melodramas we get involved in as we live out our current crop of addictions. This, too, is a part of life and growth. Every part of the system of Living Love is designed to help you learn to love everyone unconditionally — including yourself. You only need to plant the Living Love seeds in your consciousness and they will automatically sprout. Do not berate yourself because you are not enlightened by the third Tuesday of next month. The more you learn to love and accept yourself, the more you will realize that you are doing exactly what you need to do to provide yourself with experiences to grow into higher consciousness. How can you love others if you do not love yourself? The love you have for yourself and the love you have for another are building blocks joining together within you to create the beautiful edifice of real love. Learning to love unconditionally means getting free of interference from our programmed addictions — those emotion-backed demanding instructions to our biocomputer. This enables us to perceive clearly what is here and now — to evaluate wisely — and to act effectively to do whatever we want to do about it. The key to this is the instant emotional acceptance of the here and now — the emotional acceptance of the previously unacceptable. When our emotions are triggered, we cannot perceive clearly our actual life situation. Our biocomputer then sends a flow of information to our consciousness in which separation and alienation are emphasized. We create a horribly warped evaluation of the here and now based on our addictive programming. When this I happens, we magnify differences and suppress similarities between ourselves and others. And this destroys our ability to love unconditionally. We all know that just having the desire to love is not enough. As far back as we can remember we have been aware of the importance of love in our lives. We know that lack of love is responsible for most of the unhappiness in the world — for difficulties in getting along with other people, for pollution, prejudice, wars and other individual and group crimes against humanity. But what can we do about it? as when you give offense. The Living Love Way to Higher Consciousness can show you step by step why you find it so difficult to love — and exactly what to do about it. The Twelve Pathways given in the following chapter tell you what you need to do to live in the Oneness Ocean of Love all of the time.